Leading off today: Derek Ecklund rushed for 122 yards and scored three touchdowns as Clymer/Sherman/Panama broke to a big lead and then held off Maple Grove for a 25-20 win in Class D football between state-ranked Western New York teams on Saturday. Top-ranked Clymer/Sherman/Panama led No. 4 Maple Grove 25-0 after quarterback Gerrit Hinsdale hit Ecklund on a 34-yard scoring play in the third quarter. Hinsdale finished 17 of 25 for 217 yards. Maple Grove rallied with three TDs beginning with Easton Tanner hitting Carson Crist in stride near the middle of the field with for a 63-yard scoring play later in the third quarter. Crist then threw for scores covering 55 and 20 yards in the fourth quarter. More Class D: Seventh-ranked Herkimer broke to a two-TD lead and then held off No. 5 Dolgeville for a 14-12 win. The Magicians took a 14-0 halftime lead on Adam Green's 57-yard touchdown run and James Aiello's 10-yard TD pass to Brayden Alexander. Dolgeville outgained Herkimer 180-156 in the defensive struggle. Sophomore cornerback Andre McNair had seven tackles, a sack and a fumble recovery for the winners. Iona Prep impresses: Frankie McFadden had 14 carries for 145 yards and three touchdowns, and Camari Glasgow added eight attempts for 108 yards and two TDs as No. 6 Iona Prep dominated No. 9 Monsignor Farrell 49-14 in Class AA. Derek Robertson went 22-for-31 for 196 yards and two touchdowns in the win. More Class AA: Freshman Will Benjamin, who'd already made a big impression on defense this season, added offensive responsibilities to his to-do list and gained 125 yards on 14 carries as No. 8 Aquinas defeated No. 12 McQuaid 22-19. With Aquinas' top two backs sidelined by injuries, Benjamin gave Aquinas a spark with a 42-yard TD carry for a 15-12 lead. A 3-yard TD run by Damon Montgomery made it 22-12 with 3:50 remaining before McQuaid closed out the scoring with a 4-yard touchdown reception by Conor Zamiara with 2:43 to go. Aquinas then ran out the clock. • North Babylon upset No. 30 Northport 26-20 behind Dylan Diaz, who finished with 34 carries for 186 yards and three touchdowns on offense and an interception on defense. Ross Tallarico had two interceptions in the win, returning one 70 yards for a touchdown in the third quarter. Noteworthy crossovers: Burnt Hills-Ballston Lake, ranked No. 4 in Class A, set up a Week 7 showdown against No. 13 Queensbury by scoring on its first eight possessions and rolling up 463 yards of offense to beat Glens Falls 55-27. The Spartans gained 322 yards rushing on 48 attempts against Glens Falls, ranked seventh in Class B. Senior running back D.J. Lashley scored three touchdowns in the final 2:56 of the first half. • Penn Yan QB Will Rogers threw for 465 yards and six TDs on 28 of 36 accuracy to lead the Mustangs to a 49-21 victory over Wayne in Finger Lakes East action. Connor Fingar caught 13 passes for 121 yards and Brennan Pather made four catches for 174 yards, with both receivers scoring twice. Fingar also returned an interception 60 yards for a score. Wayne is ranked 10th in Class B and Penn Yan 19th in Class C.
CSH pulls upset: Ray Costa ran for 69 yards and two TDs to go with 7-for-8 passing for 157 yards and another score as No. 25 Cold Spring Harbor topped No. 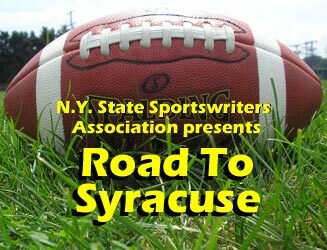 4 Seaford 34-14 in Class B.
Upsets in Section 3: Seventh-ranked Utica Notre Dame and No. 18 Canastota both fell victim to unranked Class C teams. Holland Patent quarterback Nick Herringshaw rushed for 58 yards on 13 carries and scored two of his three TDs in the first quarter of a 42-6 win against Notre Dame. Jason Haas rushed for 191 yards on 23 carries and scored the three other touchdowns as Holland Patent won its first division title since 1997. Little Falls edged Canastota 28-24 as Tony Servidone scored the game-winning touchdown late in the fourth quarter. Big numbers: St. Francis junior quarterback Jake Ritts was 30 of 41 for 448 yards and four TDs in a 43-41 loss to St. Joseph's. ... Dan Villari went a perfect 7-for-7 for 147 yards and two touchdown passes as Plainedge defeated Hewlett 34-22. ... Paul Harshbarger scored the first three times he touched the ball for Schuylerville and ended the day with 232 rushing yards to turn back Judson Falls 48-24. Scoreboard: You can check out all of the Week 6 scores on our Road to Syracuse website and also view how ranked teams fared.